On the 25th of April every year, the Adelie penguins in the Antarctic begin their annual northward migration. The Adelies start migrating in the Antarctic fall season and won’t return to their colonies until the following spring. In true synchronized fashion, the Adelies dive into the frigid waters answering their Nature’s call to migrate. 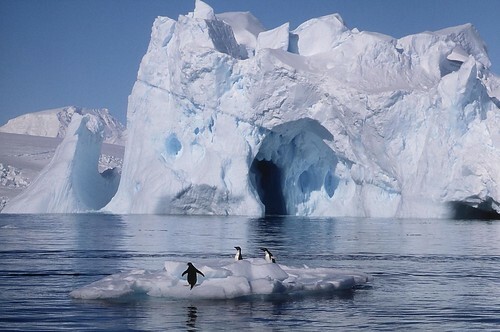 They will swim north for only a few hundred miles (around 600km) and stay among icebergs that are floating about, feasting on krill and other penguin delicacies. So really, these penguins don’t actually go anywhere when they migrate. They’ll bob around in the ocean and rest on the ice until it’s time to head back home to Antarctica. Actually, the reason they do this is because the days in Antarctica are becoming darker during this time of year. Adelies do not see too well in the dark so they migrate north so they can hunt for food, otherwise they would starve. Hope you had a wonderful Penguin Day. a charity auction of my Adelie penguin sculptures ends tomorrow (26 april 2008). Please check “holburne penguin” on ebay.co.uk. they are life size hand-made in plaster and recently decorated the “70 years of Penguin Publications” at the Holburne museum in Bath, England. This is just a reminder that there are no penguins in Alaska, not even at the zoo. Ironically, the Pittsburgh Penguins defeated Philadelphia to advance to the next round of the hockey playoffs! penguins are my favourate non-pet animal! Pingback: Happy World Penguin Day! « : Crushable - Crushable gives you the celebrity news, style and scoop on the stuff you care about. Να μας ζήσει, να τον χαιρόμαστε!!! Happy World Penguin Day and good luck to the Adélies in their migration. Para todos los pingüinos les deseo un feliz día. Well, since you suggested buying up hordes of penguin merchandise, might I suggest getting a copy of my award-winning book, The Great Penguin Rescue? It’s a first-person account of the largest and most successful animal rescue ever undertaken. I’m donating 20% of the proceeds from the book to penguin rescue, research and conservation groups. Here’s the Amazon link if you’re interested: http://www.amazon.com/The-Great-Penguin-Rescue-Devastating/dp/143914818X/ref=tmm_pap_title_0?ie=UTF8&qid=1335370848&sr=8-2 Thanks!